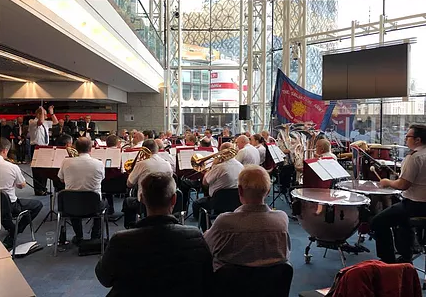 It is now sixteen years since the first invitation was given to the Birmingham Citadel Band (Bandmaster Gavin Lamplough) to provide a program of music in the foyer of Symphony Hall prior to the British Open Brass Band Championship. This year’s concert was on Saturday, 8 September 2018. The band began the program with a hymn tune, then presented Prelude on Tallis (Peter Graham), giving the rapidly gathering crowd a taste of what was to come from one of the Salvation Army’s premier bands. The band has some fine soloists. Deputy Bandmaster Mark Sharman chose to play the trombone solo You Can’t Stop God (Kevin Larsson). He played the bright and foot-tapping piece with dexterity and full trombone style, receiving prolonged and well-deserved applause. The band then launched into an up-tempo piece by Marcus Frei, 007 Light, with references to the James Bond theme, bringing a lighter side to the program. Beside the Sea of Galilee (Andrew Mackereth) created a thoughtful picture of Jesus walking beside the sea, bringing a calm interlude. The next soloist, David Taylor played the euphonium solo Varied Mood (Ray Woodfield). A fiendishly difficult piece, it explores the euphonium’s complete range, taxing the soloist in every way. Taylor, as usual, played it with dexterity and ease, bringing delight to the rapidly increasing international crowd. The band then presented one of the all-time Salvation Army classics, Eric Ball’s The Triumph of Peace. At a time when the world seems to be in chaos, the theme “Peace in our time, O Lord, to all the nations peace” was fitting and timely. The band then chose to play the march In the King’s Service (Erik Leidzén). One of the people listening was retired Major George Whittingham, long associated with the Upper Norwood Salvation Army Band and other ensembles. Bandmaster Lamplough, in a lovely gesture, invited Major Whittingham to conduct the band for this item, to the Major’s obvious joy and delight. The band looks on this annual concert as a special opportunity to not only showcase great Salvation Army music but also to provide an insight into the organization’s Christian beliefs. So, the final piece of the morning, Servants of God (Steven Ponsford) was well-chosen. This article was posted in News and tagged Birmingham Citadel Band, British Open, David Taylor, Gavin Lamplough, George Dickens, George Whittingham, Mark Sharman, Pre-Contest Festival on 3 October 2018 .